“Naughty, bawdy, gaudy…42nd Street!” Every fan of early 1930’s film musicals knows the lyrics to that song, and the story it tells of the time. From its humble farmland origins, 42nd Street became the most important entertainment address in the US. Fame, fashion, fortunes, fidelity—all became entwined with the larger than life personas of early theatrical pioneers like the Schuberts, Ziegfeld, Hammerstein and Barrymore. Individual chapters focus on the great and infamous theatres. 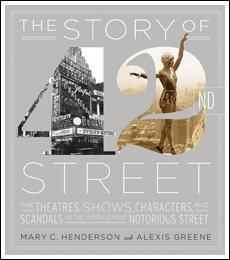 Complete with never before seen archival images, the authors give you an engrossing and unadulterated history of the theaters, actors, producers and productions that created the legend and history of 42nd Street, all in a beautifully designed package. 240 pages, 9” X 10,” over 150 illustrations (25 color, 125 b&w).